India’s Navy is celebrating another Navy Week—2018-as a year of drought. 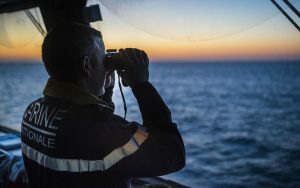 The Navy decommissioned four ships and commissioned none reducing its ORBAT but INS Arihant joined India’s TRIAD and Navy conducted twelve major International and Tri Services exercises with a high tempo. Looking back in early 1971 the Indian Navy unknowingly struck gold when eight 240 ton Osa Class missile port defence boats arrived aboard Soviet heavy lift ships at Calcutta’s Kidderpore docks, before the 1971 war was even planned. Each boat carried 4 SS-N-2 Styx anti-ship radar guided missiles with 3 Russian 4000 hp M-503G diesel engines developed 35 knots at full power manned by crews in Vladivostok. The Rangout radar (NATO Square Tie) with directed power could detect surface targets at 40 miles beyond the Styx maximum missile range of around 30 miles. CPT’s 90 ton crane unloaded the boats at Kolkata for training ships INS Cauvery and INS Tir to tow the boats to Bombay. 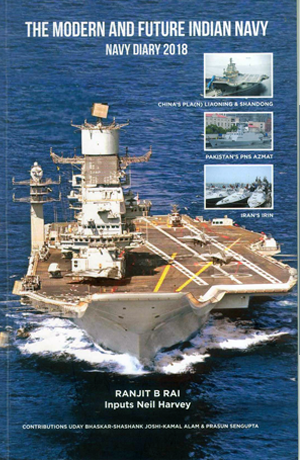 En route two 3 inch wire towing hawsers parted en route Vishakhapatnam and splicing them at sea was a challenge which IDF as Executive Officer INS Cauvery reported to his ex ND boss Chief of Staff Commodore M S Grewal requesting for spare hawsers. He called ND(V) whose constructors, after consulting Soviet guarantee specialists, installed Garware light nylon hawsers all round the Missile boats in clamps like a necklace, which made towing convenient with a easy release system. It was this successful innovation that generated an idea to enhance the range of Osas (literally ‘wasps’) from home base under tow to a target far away, then let the boats loose at night for attack on Karachi. Even the Russians had never thought of this. The credit for the Towing Necklace goes to the Constructors which enabled Admiral SM Nanda and Vice Admiral N Krishnan to plan for the 1971 war. 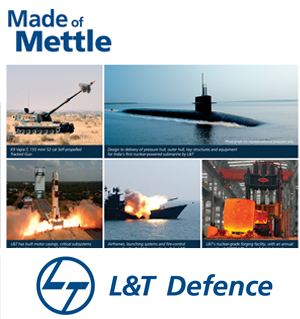 Facilities were set up for the “25th Killer Missile Boat Squadron” at Mumbai under Russian trained Cmde B G Madholar at Mankhurd who sent Lt P Bhasin to Porbunder to set up a small advance Technical Position (TP) to test missiles as the take off port. Nanda employed the RN Staff College tri-appreciation, and asked his DNO Commodore O S Dawson, his NA Capt. V P Duggal and Vice Admiral Nilkanth Krishnan (appointed as Flag Officer Commanding-in-Chief Eastern Naval Command) for independent war plans. CNS Nanda the ‘Bomber of Karachi’, knew Karachi port well having worked there as a junior before joining the Navy, cited ‘boldness and secrecy’ as attributes in ‘India’s Principles of War’. Nanda dictated the key Operational Orders for the daring attack on Karachi to his HQ staff to a young relation sworn to secrecy and sent the charge documents (CDs) to Vice Admiral S N Kohli, Flag Officer Commanding-in- Chief Western Naval Command to exercise the Osa boats for the attacks, and informed PM Mrs. Indira Gandhi of his plans to attack Karachi. She did not object. In a closed door Chiefs of Staff Committee meeting chaired by Gen Sam Manekshaw, Nanda asked Air Chief Marshal PC Lal for an air strike on Karachi at dawn on the first day of the war to soften Karachi. When Manekshaw found Lal regreted it, saying it would be suicidal till Badin radar was knocked out by MiG-21s, Sam said in Punjabi, “Chotta brah ek strike mang raha hai. De de,” (small brother is asking for just one strike, give it) and added “Marange to marenge, asi ladayi karan ja rahi hai, mohabaat nahi.” (Die if we have to, we are going to war, not to make love). Thus was the dye cast. Air HQ tasked Hunters from Jamnagar for Karachi on break of war, but OC reported Hunters would not have adequate fuel for the task even with the drop tanks and only 20mm guns. Adm SM Nanda was determined and attached one missile boat to be in tow with Rear Admiral Chandy Kuruvilla’s Western Fleet with INS Mysore (Flag Captain Russi Ghandhi) to lead the strike by operating near Karachi. War was declared on 3rd December night when IAF airfields were struck as Mrs Gandhi leaked 4th as the date to Pakistan and told Chiefs to be ready. 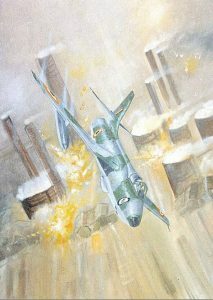 The Western Fleet was 120 miles from Karachi but the Fleet Operations Officer Cdr Gulu Hiranandani feared the Fleet was spotted on 3rd December by a small civilian Pakistani plane and though close to the Makran coast, steered away and failed to strike, and maintained radio silence belying NHQ expectations. 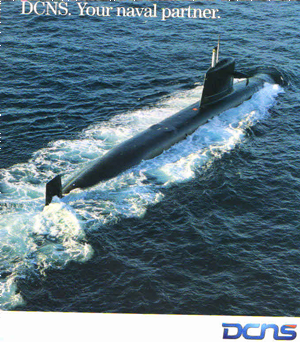 Nanda was furious, and ordered the three Missile boats at Porbunder to strike Karachi by night and Lt Bhasin later Vice Admiral builder of INS Arihant tested the missiles and as none failed got a VSM. On 4TH December night the three Osa class Killer missile boats ingeniously struck Karachi in Op Trident with their long range Rangout radars and P-15 Styx missiles, and sank PNS Khaibar, PNS Muhafiz and MV Venus Challenger. The Osa Boats were towed by larger ships with the ‘Rope Necklace’ and let loose nearer Karachi. The low silhouette of the boats ensured Pakistan’s radars at Badin and Karachi were unable to locate them. Task Force Commander Capt Gopal Rao (INS Kiltan) and Cdr B.B. Yadav, were awarded the Maha Vir Chakra. Lt Cdr B.N.Kavina (INS Nipat), Petty Officers M.O. Thomachan, R.N.Sharma and L.K. Chakravarty and Lt Cdrs Inderjit Sharma (INS Nirghat) and O P Mehta (INS Veer) received Vir Chakras. 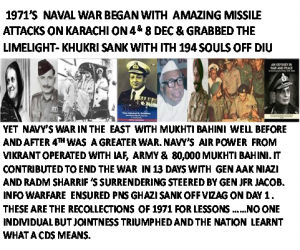 Pakistan Navy under CNS Admiral Muzaffar Hasan assumed it was an air attack that Karachi had witnessed that morning. Hasan was abruptly retired on 22 December 1971. IDF met his son to get the story. Interestingly by sheer happenstance and a local clearance by Air Cmde Pete Wilson on 4th December morning, four Operational Conversion Unit (OCU) 56-A Hunters under Wing Cdr Don Conquest with recently UK supplied two 235 gallon drop tanks with no rockets slung on the pods, to enable a high-low-high sortie with five minutes over Karachi with 20mm cannons took off in formation. Strike leader Conquest (migrated to Australia), Sqn Ldr (later Gp Capt) S.N. Medhekar his winger now in Pune, Flt Lt. (later AVM) P.K. Mukherjee in Salt Lake City Kolkata and Flt Lt. (later Wing Cdr) S.K. Gupta recall that mission. Don Conquest recounts, “As per SOP (standard operating procedure) we dipped off Karachi and fired a few rounds into the sea to test our guns. Mukherjee’s guns jammed, so three pressed on at 500 ft along the coast. As we neared Karachi , the large silver oil tanks on the skyline, shone in the rising sun. We made two gun runs without difficulty and after the first, there were huge balls of fire and volumes of smoke coming out of the storage with took off for Jamnagar having set the Kemari oil tanks on fire at around 0830 (PST)”. A Passing Out Parade was held at the Naval Academy with Iraqi Cadets too written up in Pakistan Navy’s History. The IAF attack went unreported in India as the Hunters films were not immediately processed in the ‘fog of war’, and the Navy took the credit for years. Army HQ asked IAF for Hunters to relieve pressure on the Longewala post by Pakistan’s 38 Cavalry and 51 Bde. On landing the Hunters were armed and hurriedly fueled on landing, and flown to Jaisalmer in Rajasthan to support the Army under attack from Pakistan. IAF saved the day and Wing Cdr Don Conquest was awarded a Vir Chakra for the Longewala operations. The two missions in the opening bell of the 1971 war were big blows for Pakistan. The Navy, Air Force and Army went into Blitzkrieg action into East Pakistan with Mukhti Bahini volunteers, who had local knowledge of the terrain and Pakistani posts. 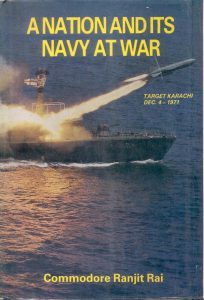 On 8th December night the Navy repeated the missile attack off Karachi in Op Python and relit the fires on the Kemari tanks and attacked ships off Karachi. Lt Cdr Vijai Jerath (INS Nipat), was awarded the Vir Chakra. IDF MAKES A CASE THAT AS INDIA DOES NOT HAVE AN ARMED FORCES DAY 4TH DECEMBER SHOULD BE MADE ARMED FORCES DAY AND FLAG DAY FROM 5TH DECEMBER ….like the Poppy Day in UK and Ireland.